SAIN3 provides a faster, enhanced Magento eCommerce solution, pre-configured to use Redis. Redis is an advanced key-value store with full cache tag support. It's the best caching solution for big Magento stores. SAIN3 provides a faster, enhanced Magento eCommerce solution, pre-configured to use Redis. Redis is an advanced key-value store with full cache tag support. It's the best caching solution for big Magento stores. Redis' high-performance and high-stability are proved in testing on high-traffic Magento stores with more than 500,000 visitors / day. SAIN3 is here to help you set up your eCommerce site fast and easily. 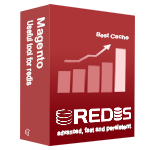 Redis is pre-configured to speed up your Magento site. phpRedisAdmin, a simple web interface to manage Redis databases, is also provided out-of-the-box. The Auto Back-up function automatically backs up your entire database like Magento. Ensure your customers can access your websites at all times and keep all your data extra safe.